I'm so happy to be a super small part of two events this month. First is Bear and Bird Boutique + Gallery's Small Stuff 5 show, set to open the 20th. It's a lovely Sunday brunch opening with affordably priced artwork. I saw a chance to do something just a bit different and thus keep in line with 'affordably priced'. I had three of these blocks in my drawer and Ed suggested (honestly, what would I do without that man?) I just paint heads. 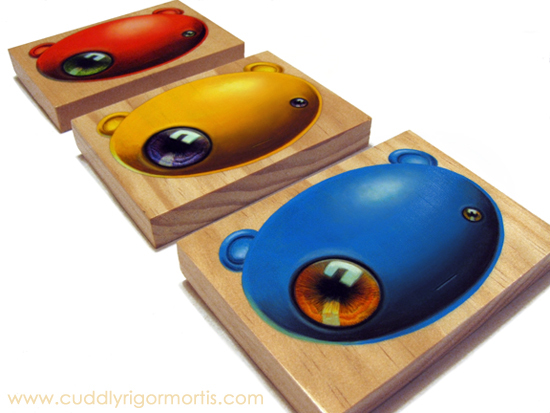 That lead to primary colors which lead to bears which lead to what you see here. "Cinnamon Bear", "California Golden Bear" and "Tibetan Blue Bear" all measure around 5.5" x 3.75" and will be $75 a piece. Since it's a cash and carry event I'd suggest getting out of bed that particular Sunday (if you're in Florida) and getting some early shopping done. That same weekend is the Holiday Art Star Craft Bazaar in Philadelphia. It's put on by none other than the great gals, Erin and Megan, at Art Star Gallery & Boutique. They've done the show in the springtime, but this is their first holiday event and starts off with a bang Friday November 18th with their V.I.P preview party. This will include snacks, drinks, live music by Olive Juice, a free Art Star Craft Bazaar Tote Bag, Photobooth Fun w/ Love Me Do Photograpy,+ first dibs on all of the amazing work! I'm not an official vendor, but since they carry my work in their shop, they're bringing along a collection to the show as well. Since it's fairly close to our home, Ed and I will be leaving the comforts of our wooded lair to attend the party and mingle with other people. Insanity!